Long before we came to be known as the Gateway to the West, St. Louis answered to another epithet: Mound City. The origins of this nickname lie in the earthen mounds constructed 1000 years ago by Native Americans of the Mississipian culture. Today, these mounds are largely concentrated in the Cahokia Mounds State Historical Site, which was once the largest ancient city north of Mexico City. 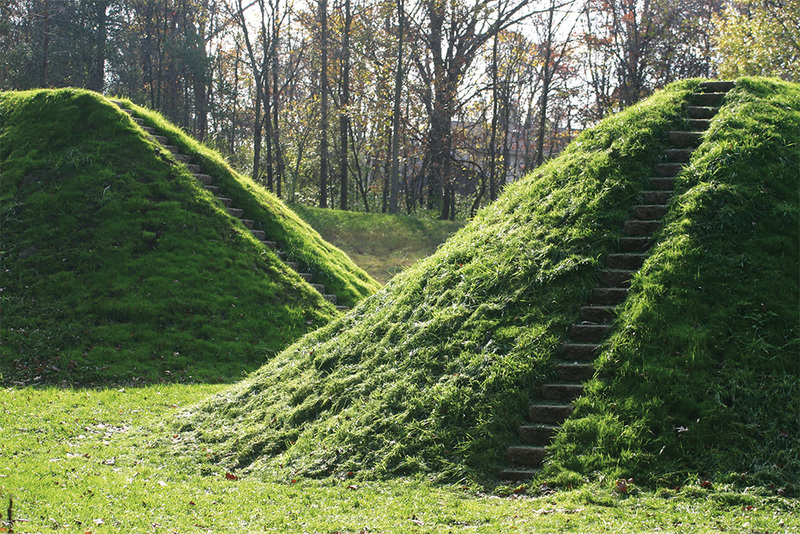 The earthen mound “Cromlech Glen” by Beverly Pepper is a permanent exhibit at Laumeier. Photo courtesy of Laumeier Sculpture Park. Prior to the 19th Century, mounds of various sizes were scattered throughout St. Louis city limits, but as the city grew, these structures were leveled to make way for modern architecture. Just as the mounds have been physically erased from the city’s landscape, the stories of these native cultures have been largely omitted from history books. The 2014 Mound City exhibit at Laumeier Sculpture Park examined this forgotten past through a collection of contemporary interpretations of disappearance and destruction. TOKY designed the Mound City catalogue, an exhibition book comprised of three main pieces: an introduction from the exhibit’s Chief Curator and Laumeier’s Executive Director Marliu Knode; exhibition photography; and a collection of essays examining forgotten native cultures and the erasure of historic landscapes over time. 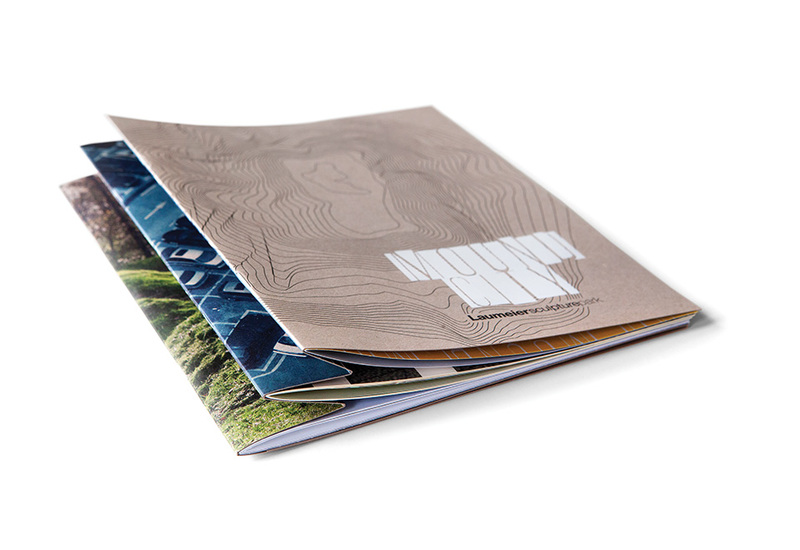 Three interior booklets are saddle-stitched into one 64-page catalogue. That dimensionality was also echoed in the book’s typography. “We were going for typography that was as dimensional and layered as the book and the content,” says Designer Kelcey Towell. Early logo sketches were inspired by the physical landscapes of the mounds, as well as patterns and shapes used by Native cultures. “We pulled inspiration from urban landscapes, Native American patterning and shapes, and the advance and recession of both letterforms and historic and modern societies,” Towell says. An initial round of logo sketches inspired by an aerial map of the Cahokia Mounds Historic Site. On the cover, the foil logo uses a balance of positive and negative space — a theme that is echoed in patterning that graces the catalogue’s interior pages. 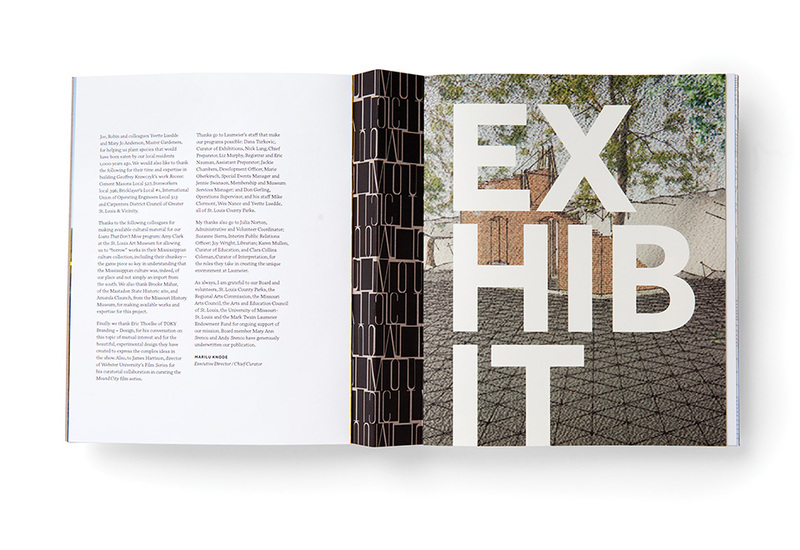 Patterns and typography used on the catalogue’s cover are pulled into interior pages. 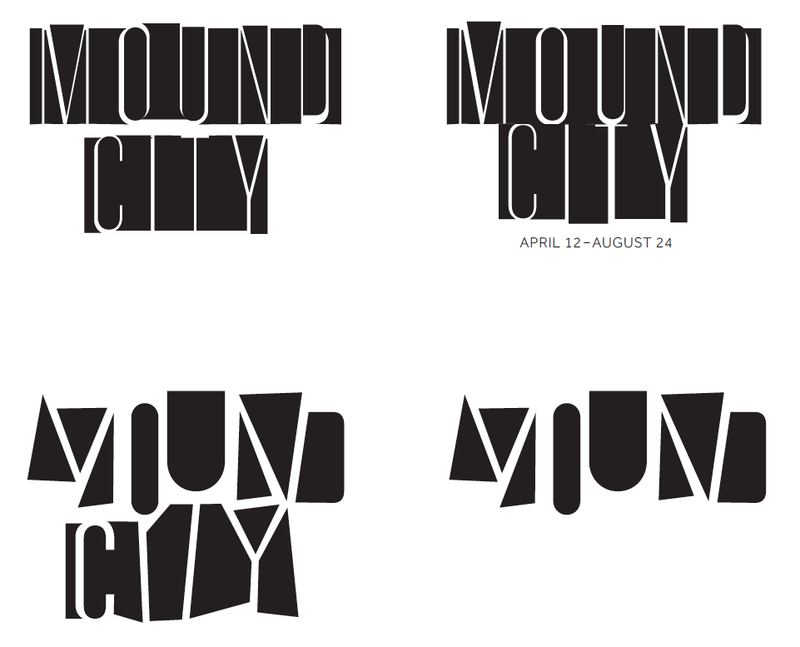 Earlier this year, the Mound City catalogue was included in Communication Arts’ 2014 Design Annual, and we’ve just gotten word that the work has also been listed in Communication Arts’ 2015 Typography Annual. Congrats to our designers and clients on the win!